Do you notice the Mexican flags? All those millions of unsupervised and undocumented aliens should make everyone nervous. America needs immigrants, but we need immigrants that are loyal only to the United States. 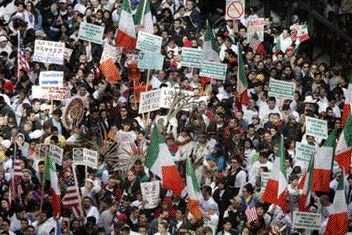 The Mexican government has been openly telling Mexicans who have become naturalized Americans that they can also retain their citizenship and loyalty to Mexico. The U.S. oath of citizenship makes that a moral and legal impossibility. Yet, on March 20, 1998, Mexico passed a law that purports to reinstate Mexican nationality for Mexican-Americans who have become naturalized U.S. citizens. Mexico has since issued tens of thousands of documents to naturalized Americans who came from Mexico. They want justice. "¡Sí, se puede ! Yes we can WHAT, one wonders?" Yes we can...make demands of the government, even though we're here illegally? Yes we can...break your laws then demand to not only not be penalized, but to be rewarded for it? Yes we can...take taxpayer-funded services like education and healthcare, and in exchange we'll drive down wages and refuse to assimilate? Yes we can...shout loud enough about our civil rights that the politicians will forget that civil rights are, by definition, for citizens? Where did they get the idea? From the meddling Mexican government that encourages dual citizenship and is playing the remittance game. Postscript: Look at these employment figures and then decide if we need all those that work for less.